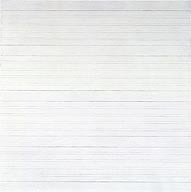 Agnes Martin’s work can be tricky, all lines and grids and pale neutrals. It used to make me wonder, what’s the big deal? Pencil marks and a wash of color–not so impressive. I chalked it up to those nutty Abstract Expressionists and Minimalists, divorcing themselves from the real world and delving into a world I didn’t know how to get into. But then I got a job as a docent at my college’s art museum, the Frances Lehman Loeb Art Center. I gave tours, but I also spent a lot of time in the galleries at the docent’s table, where we waited for visitors to ask us questions (and maybe did some homework when things were slow). The table was situated right across from their Martin, The Harvest (1965). Being forced to look at this painting nearly every day, at least for a few minutes before a visitor approached me, completely changed the way I viewed Agnes Martin’s work. The Harvest, with its imperfect grid and odd “T” in the corner, became a quirky friend I saw each week–a comforting presence away from papers and tests. 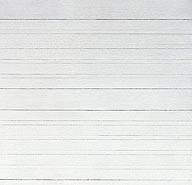 But I’d never spent any long, uninterrupted time with an Agnes Martin. Seeking some quiet time away from my email inbox this past week, I wandered past Milwaukee’s Agnes Martin painting and then stopped and turned around. It was time for a 45-minute slow look at Untitled #10. Like many abstract works, my mind began to associate the piece with the “real world” almost instantly: lined paper from elementary school, a map, a whitewashed fence, a dirty grey wall, a storm. As my mind slowed down and I began to let the piece envelop me, the fast pace of my thoughts began to move from thoughts of natural occurrences I associated with the lines and pale background, to the very real nubs of canvas and graphite lines and all the texture they create. 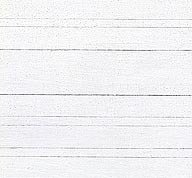 From afar the lines seem straight and linear, without mistakes; up close it becomes clear they were not drawn with a ruler, but instead by hand along the bumpy lines of the canvas. I am a details person. I love to get up close to works of art, my nose inches away (shh, don’t tell the guards–I’m very careful). But this piece resisted me–or perhaps I resisted it–until I stepped far, far back. I walked over the Carl Andre floor sculpture and sat on the bench on the far end of the gallery. And it was there that this piece opened up completely. From afar, there is a luminosity to this work that you simply don’t get close up. It’s like an optical illusion. The work feels bigger and huge and whole when you are far away. You are sucked into it and simultaneously very conscious of being outside of it. And something about it glows, softly and quietly, almost like a lightning bug. Everything else around it seems suddenly duller (which is saying something, because this work is flanked by a very bright Frank Stella painting in our galleries). Go forth and respond! You can find her work in Gallery 18. PS: Wondering why the images in this post are so small? Copyright protections prevent us from showing some images larger than this thumbnail size. All the more reason to see this piece in person–reproductions do it no justice. 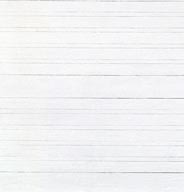 This entry was posted in Art and tagged 20th century art, Abstract Expressionism, Agnes Martin, From the Collection, Minimalism, Modern art, Slow Art. Bookmark the permalink.